Knitters, and thrifty housewives, are often appalled at the treatment given to wool-made fabrics in the finishing process, because this is so exactly opposite to the methods used in washing knitted goods; but as the aim when finishing wool textiles is to cause, and not prevent shrinkage, the difference in handling is logical. Really soft water is the secret of textile processing. Rain-water is ideal, but failing this tap-water can be softened by adding a teaspoonful of “Calogon” (Allbright and Wilson) to every two gallons. Soak wool fabrics in hot water, leaving until the water is cold. If the fabric is made from greaseless, worsted-spun yarn, and is perfectly clean, wring to removes as much moisture as possible, and hang for an hour or so to drip. Whilst still damp, roll round a thick dowel or roller – the larger the better. Keep the cloth perfectly straight with the weft in line with the roller, wind as tightly as possible without a suggestion of a crease and mould it to a uniform width all the way down. Leave for a period varying from 12 hours to 3 days, according to the quantity of material and the size of the roller, then re-roll from the other end and leave for a similar period. If necessary, repeat this process until the fabric is dry to the touch. 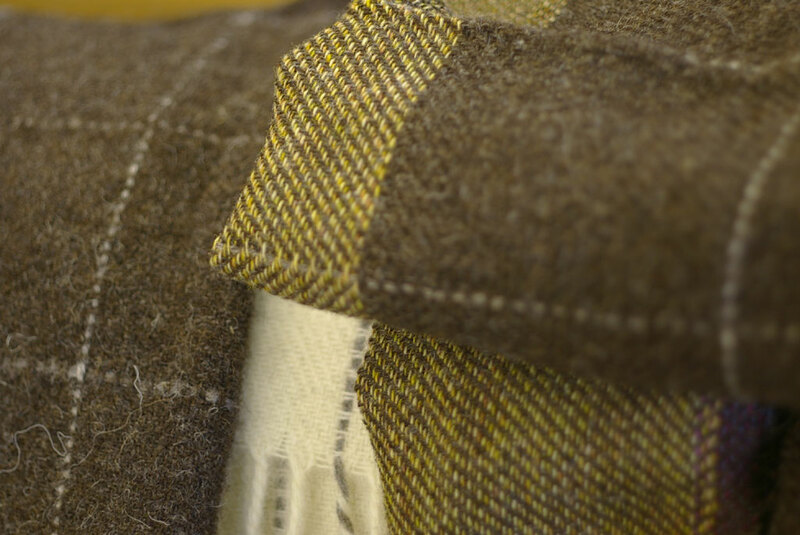 It is of the utmost importance to ensure that damp, wool fabrics are not left creased; as if allowed to dry in this condition, the creases are almost impossible to remove. Finish off by pressing lightly with a moderate iron until thoroughly dry, and do not roll or fold, except in loose, zig-zag formation, until quite cool. A woollen-spun fabric requires felting. Wring lightly after soaking, then put into a large bath containing a small quantity of hot, rich soap-suds made with pure soap flakes. Pummel the cloth vigorously, or stamp about on it in your bare feet. If the soap disappears, dissolve some more. Do not allow scum to collect; if the water is soft and hot, and you use plenty of good quality soap flakes, there will be no scum. You cannot hurry the process but with experience you will know by “feel” when the cloth has thickened and softened to a pleasing texture. The whole area of the cloth must be subjected to pressure and friction, and lubricated with soap, before it will assume the required characteristic. It is helpful to pass the cloth over a board, preferably grooved, placed across the bath, to ensure that all parts receive attention.